There is something mysterious about this land. The ground seems to know deep history as my feet kick up the dirt. I shifted my weight and my boots settled deeper into the earth. A woman led a full grown cow and a calf up the mountain path above me. She had a basket on her head and a baby in her free hand. The other hand held a stick that she used to tap the flanks of the cattle to correct their steps. She was in traditional dress and I imagined that she was recreating a scene that she had painted thousands of time. 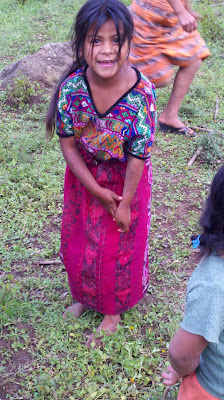 The native Guatemalans in this area are largely descended from The Aztec, and much of that strong culture lives on in them today. They have a dialect rich with words, sayings, and sounds from their historical roots. Much of the influence of their dress and especially their views of the world and religion reach back through time to grasp the powerful belief of that incredible culture. I close my eyes and take the air deep into my lungs. I focus my ears on the sounds that enclose the quiet of my mind. I can hear the easy wind coming off the volcano and shifting the branches of the trees. In this moment I am sure that I somehow am experiencing this panorama as it was hundreds and maybe thousands of years ago. I find integrity and honesty in this concept. Something that has gone largely unchanged for such a long time… simply must have something to whisper to me. And then, my world was seized, my mind arrested, and my heart absolutely conquered. She held my gaze with a confidence that should have been unnerving. But as I was pulled into the reflection of her deep brown eyes I felt only a sense of peace and knowing. She began to walk towards me, and never took her eyes off my own. Again, and even stronger, I felt myself being pulled through the years to a place that existed only in the past. I felt like I was being observed and noticed by a perspective that saw much more than I could take in. As she approached, I reached out my hand and took hers. She smiled and I had a friend for life. I knelt down in the grass beside her and we played with lime skins, tossing them back and forth at each other, and of course I had to up the ante’ and so I made a catapult with a twig and launched a piece of the skin in an arc that ended on top of a woman’s foot. Both my muse and interrupted the solemn nature of the moment with our laughter. My attention shifted back into the present and I began to listen to the words spoken and look at the expressions of those who surrounded me. We had completed 2 homes in 4 days, and this moment was the dedication of the first. We had tried our best and come up so devastatingly short to live out the teaching of feeding the hungry, clothing the naked, and providing shelter to the homeless. 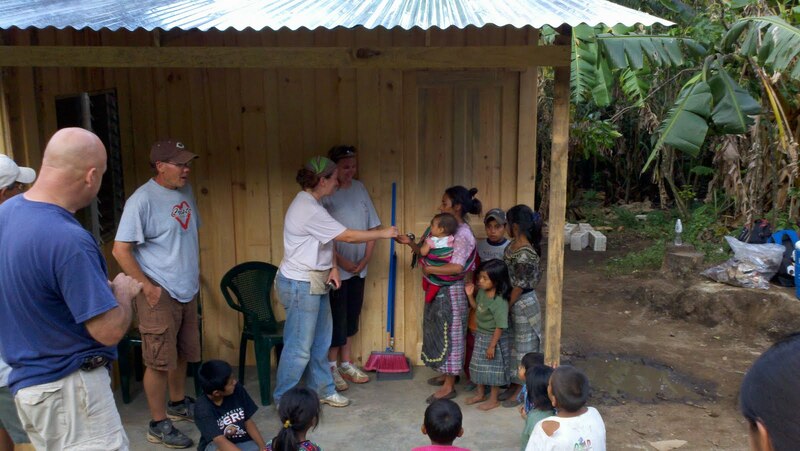 Margaret & Callie handing over the keys on Casa #1. When you put yourself out there, and make yourself vulnerable… you see how much you are capable of doing for good in this world. So many times we think that we can’t make a difference. I can tell you this… when you take the time to help the people you CAN, you forever make a difference in their lives, as well as your own. As keys were placed into the hands of a mother who has been widowed from an industrial accident, and had a son killed in a recent mudslide, I was overwhelmed as I looked on at her and her four young children. Now those kids have a chance at life. I looked back into the eyes of the young girl. She was at my side now, still looking up at me with those endless eyes, pure smile, and dark hair that wisped across her face. I knew that when the sun sank below the horizon of the mountain tonight, her bare feet would carry her back to her small corn-stalk and scrap shanty with dirt floors where she would lay in hopes of chasing away the night. We had to leave. Walking up that steep path I felt that I may not be able to make it to the Suburban. I wasn’t even sure that I wanted to. How could I leave this place when the need is so great? How can I walk away when what I can give can make such a dramatic difference? How is it that now I get to ride in a vehicle to a place with warm showers, hot meals, and soft beds… while this little girl curls up in the dirt in an open air shack? Many small hands reached up for hugs as I fought my way to the cowardly safety of the car. I hugged each one that reached for me and then began hugging those who weren’t reaching. The reality of the poverty here… set against the backdrop of the powerful history of this culture, the beauty of these people, and the abundance of my own life—all of this is an overwhelming force. As I sit here back in modern surroundings late at night here at our team house, my mind is focused on the words of Edgar as he spoke to the community of Cerro Alto as they gathered around the new homes. He told them that The God had made this provision. The God had provided through us, to them these homes. We do this because of what The God has done for us. He spoke of a home that God has prepared in heaven, and told them of a way to get there. 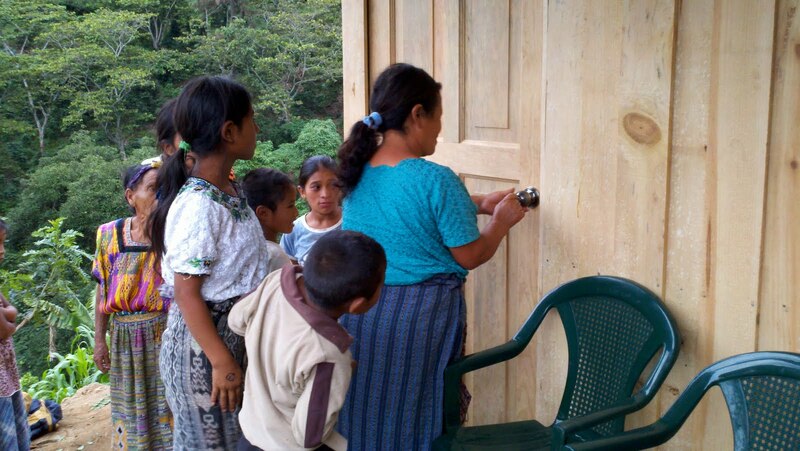 Catalyst Resources International has now built 4 homes in Cerro Alto, and a total of 9 in Guatemala. I have personally placed block and hammered nails on 3 of them, along with my wife and my closest friends. We all feel inadequate to this task. But the enormity of the challenge is tempered by the unlimited potential to make a difference. The picture of the little girl that I met in the final moments before our departure is now the wallpaper on my smartphone. I don’t even know her name, but she made a permanent impact on me. On our drive back I was sharing some of this to the members of our team and Kellie gave me a significant piece of information. This little girl has some cognitive difficulties and has trouble interacting with the world in the normal manner of a child. Most likely she would have a diagnosis and a treatment team if she lived in the U.S. But in this village, on this mountainside in Guatemala… life will not give her this luxury. If I were able to pick her up and take her out of there today, I would have. I know this to be true… and yet, I also know this would be the easy way out. This story is bigger than me, and it is even bigger than a little girl with endless brown eyes in an ancient land. This is a story about what we do with what we are given. The provision has been made. GUATEMALA 2011: (6) Truth, Lies, and a Dare. GUATEMALA 2011: (12) No Way I'd Try That! GUATEMALA 2011: (17) Change The World With Me. Insane, Unbelievable, or Authentic... you decide. Shake What The Good Lord Gave Ya! GUATEMALA 2011: (22) Nunca Cansado...forever.